We all know children are little stars, but getting them to do what you need them to do when you need them to do it sometimes requires a little gentle persuasion. Our large Star Chart helps to do just that. Its a great visual way to set tasks and show your children how far they are progressing towards being rewarded for their hard work. Parents set the tasks  there are 20 to choose from or you could use the dry wipe marker to write your own  ranging from going to bed on time, doing homework, tidying up toys or brushing teeth and you also set a target for how many stars must be achieved in a week. Every time your child successfully completes their task, they receive a star and accumulate them over a period of time with the ultimate goal being a reward at the end of it. You can use the dry wipe marker to fill in what each childs individual reward will be so its fully bespoke and personalised. 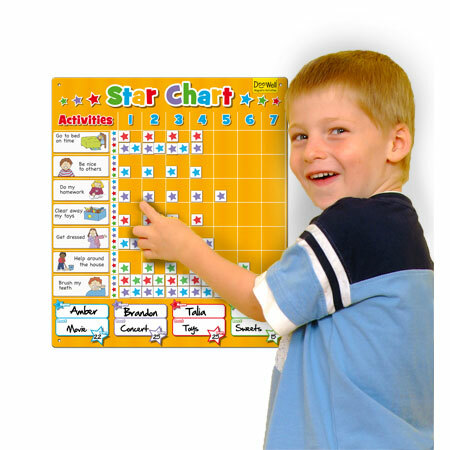 The chart features enough space and magnetic pieces for up to four children. It is bright and engaging, and above all, fully interactive. Now with magnetic backing, you can put the star chart on any magnetic surface - including your fridge! It can also be hung on the wall so its visible to everyone. Includes dry wipe pen. 5 Stars - we bought this chart for our daughter, who is three and a bit. She loves to get stars and we find that she responds much better to rewards than to punishments; her behaviour has really improved since we started using this chart regularly.